Our project is beginning to take form, but it's not yet a game. Let's breathe some life into this baby! The creation of asteroids will be handled by a function. This function will be run (called) on a regular basis as part of our game loop, a function which is called on a repeating basis to handle various game functionality. As with the ship object in the previous chapter, we're taking a shortcut by adding a circular physics body (radius=40) to all asteroids, even though the asteroid image isn't exactly circular. In time, you'll learn how to add an accurate shape-based physics body to any object. Finally, let's assign the asteroid a myName property of "asteroid". Later, when detecting collisions, it will simplify things to know that this object is an asteroid. Now that we have a new asteroid on the screen, let's set its point of origin. For our game, asteroids will come from the left, right, or top of the screen — it wouldn't be fair to have an asteroid sneak up from behind! Observe an important distinction about the Lua language: when you are assigning a value to a variable, you use a single equal sign (=). However, if you are doing a comparison in a conditional statement, you must use two equal signs (==) to indicate that you are checking for equality instead of assigning a value. To tell Lua that you're finished with a conditional structure, use the keyword end. The parentheses around the comparison are optional, but many programmers use them for clarity or to build more complex multi-condition statements. Since this asteroid will come from the left side, we set its x property to -60. This should be a sufficient amount to ensure that not even a portion of the asteroid is visible to the player when it's first created (it's entirely off screen). 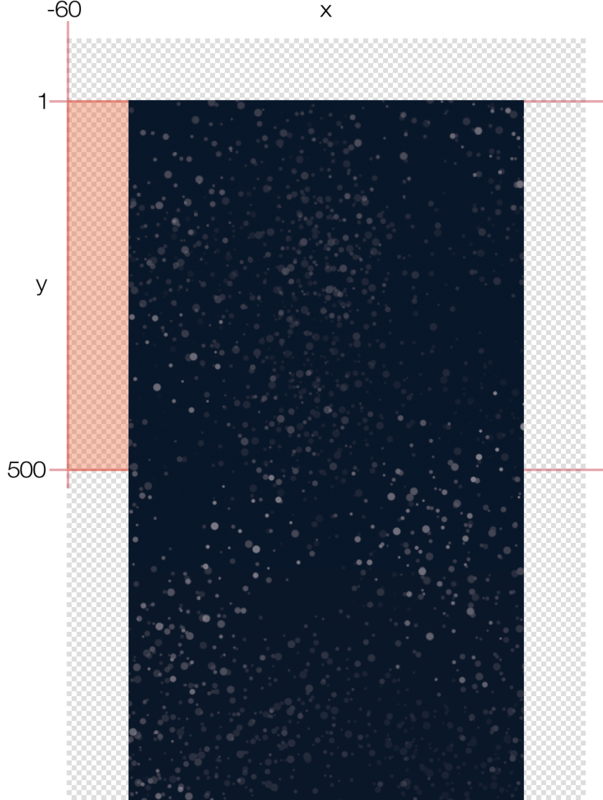 As for the y property, we use math.random() once again to randomly select a value between 1 and 500, effectively making the asteroid appear somewhere between the top of the content area and about half the distance down — after all, we don't want any asteroids coming from a place that makes it impossible to shoot them! Now that we have the starting point, we need to tell the asteroid where it should move to. This time we're going to use another physics command: object:setLinearVelocity(). This command is similar to the object:applyLinearImpulse() command which we used in the previous project, but instead of applying a sudden "push" to the object, it simply sets the object moving in a steady, consistent direction. This might look complicated, but object:setLinearVelocity() simply requires two numbers indicating the velocity in the x and y directions respectively. The only twist we're using here is math.random() to randomize the values so that each asteroid moves in a slightly different direction. Notice that we call math.random() with two parameters this time, while before we called it with just one. When called with one parameter, the command randomly generates an integer between 1 and the value you indicate. When called with two parameters, the command randomly generates an integer between the two specified values, for example between 40 and 120 in the first instance above. If we decided to call/run this function now, we might see an asteroid slowly moving across the screen from the left side, but probably not. Why? Because we haven't added conditional cases for the other two sides of the screen! Remember, Lua is randomly choosing a number between 1 and 3, but currently we're only handling the occurrence of 1, so there's just ⅓ chance that our current code will generate an asteroid. With these lines, all three conditions are properly accounted for. 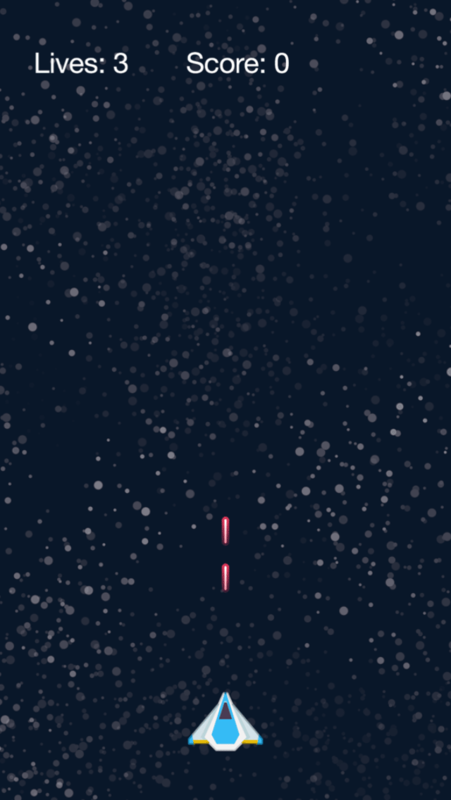 Now, when this function is called/run, an asteroid will randomly appear in one of the three specified regions and begin moving across the screen. What is a shooting game without shooting? Getting our ship to fire lasers is similar to loading asteroids, but this time we'll use a convenient and powerful method to move them known as a transition. Essentially, a transition is an animation method which allows you to change the "state" of an object across a defined amount of time — this can include the position, scale, rotation, opacity, and more. You can even perform multiple transition effects in one line and specify an "easing" algorithm to make the transition run with non-linear interpolation. We create a new laser object inside the mainGroup display group, using 5 for the frame number since the laser is the 5th frame in our image sheet configuration. We add it to the physics engine as a sensor type object (isSensor=true). We indicate that the laser should be treated as a "bullet" by setting its isBullet property to true. This makes the object subject to continuous collision detection rather than periodic collision detection at world time steps. Because our laser will be moving very quickly across the screen, this will help ensure that it doesn't "pass through" any asteroids without registering a collision. Finally, we assign the object a myName property of "laser" which, similar to the ship and asteroids, will be useful when detecting collisions. The object:toBack() command sends an object to the very back of its own display group, but that's not necessarily the very back of the entire parent stage group. The above command will send the laser object to the back of its display group (mainGroup), but it will still appear in front of the background image contained within backGroup. As mentioned earlier, we'll move the laser up the screen using a transition. Most transitions are performed with the transition.to() command. In its most simple form, this command accepts an object reference, such as the laser, and a table of parameters to change over a specified time. As you can see, the first parameter is the object to transition (newLaser). For the second parameter, we include a table which can contain various properties for the transition. Here, we set y=-40 which indicates the laser's vertical destination, slightly off the top edge of the screen. We also set a custom time parameter of 500. For transitions, the time (duration) should always be specified in milliseconds — remember that 1 second equals 1000 milliseconds, so this transition will occur over a duration of ½ second. Great! New lasers will now correctly appear at the same location as the ship (visually behind it too) and move upward across the screen. There is just one last thing to implement, and it's very important: cleanup. In any app, it's critical that you remove objects from the game which are no longer needed. If you don't, the app will eventually slow to a crawl, run out of memory, and crash — not a good experience for the player! Simply stated, this addition tells Corona to run a function when the transition completes. Inside the function, the only command we need is display.remove( newLaser ) which removes the laser object from the stage. Beyond that, Lua's built-in garbage collection process will automatically free up memory that was allocated to the object. Those with a keen eye will notice that the function specified after onComplete = doesn't have a name. In Lua, this is known as an anonymous function. These are useful as "temporary" functions, for functions needed as a parameter to another function, etc. Although we could write a dedicated function to remove the lasers and call it via the onComplete callback, it's easier to use an anonymous function in this case. Let's check the result of our code. Save your modified main.lua file, relaunch the Simulator, and try tapping/clicking on the ship to see how it fires lasers. Now we're getting somewhere! Notice that, unlike our previous functions, this function has the keyword event in the parentheses following its name. As you learned in the BalloonTap project, Corona is largely an event-based framework where information is dispatched during a specific event to an event listener. Specifically for this routine, the event parameter (table) tells us what object the user is touching/dragging, the location of the touch in content space, and a few other pieces of information. You'll see this event parameter used frequently as you move forward and study existing code samples, so it's a good idea to become familiar with it now. Inside the function, to make things a little clearer, let's set a local variable ship equal to event.target. In touch/tap events, event.target is the object which was touched/tapped, so setting this local variable as a reference to the ship object will save us some typing as we work through the function. "began" — indicates that a touch has started on the object (initial touch on the screen). "moved" — indicates that a touch position has moved on the object. "ended" — indicates that a touch has ended on the object (touch lifted from the screen). "cancelled" — indicates that the system cancelled tracking of the touch (not to be confused with "ended"). Directly following this, let's store the beginning "offset" position of the touch in relation to the ship. Conceptually, as illustrated here, a touch can occur in various places within an object's bounds. In our code, event.x - ship.x gives us the horizontal offset between the exact touch point on the screen (event.x) and the ship's x position (ship.x). We set this as a property of the ship (touchOffsetX) for usage in the next phase. For the "moved" phase (as you can guess), we move the ship! This is done by simply setting the ship's x position, but look carefully — this is where our touchOffsetX property comes into play. 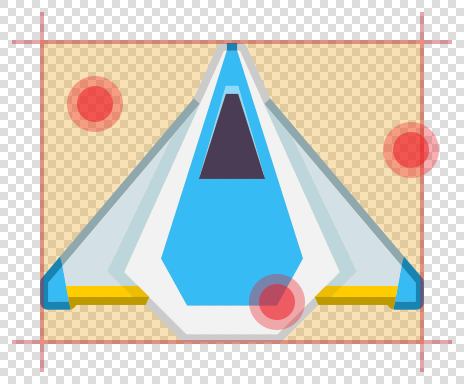 If we ignored this offset and simply set the ship's x position to event.x, its center axis would skip/jump to the exact touch point on the screen and, as illustrated above, the touch point within the ship bounds may not be exactly at the center. Fortunately, factoring in the offset value will produce a smooth, consistent dragging effect. As the comment indicates, this short but important command tells Corona that the touch event should "stop" on this object and not propagate to underlying objects. This is essential in more complex apps where you might have multiple overlapping objects with touch event detection. Adding return true at the end of touch listener functions prevents potential (and usually undesirable) touch propagation. Let's check the result of our code. Save your modified main.lua file, relaunch the Simulator, and experiment with touching and dragging the ship around. Many games include some type of game loop to handle the updating of information, checking/updating the state of game objects, etc. Although it's entirely possible to build a game in Corona without ever implementing a game loop, we'll use one here to illustrate the concept. A game loop function is usually short — instead of containing a large amount of code itself, it typically calls other functions to handle specific repetitive functionality. Our game loop will be used to create new asteroids and clean up "dead" asteroids. Now add the following lines to simply call the createAsteroid() function that we wrote earlier in this chapter. Effectively, each time the game loop iterates, it'll generate a new asteroid. For this game, let's remove asteroids which have drifted off screen by looping through the asteroidsTable table. Remember when we declared this table as a place to store a reference for each asteroid? It may not have seemed relevant at the time, but now it's coming fully into play! To loop through the table, we'll use a Lua for loop. Essentially, a for loop lets us use an index variable to count either up or down from a starting number to an ending number. Notice that Lua for loops, similar to functions and conditional statements, conclude with the familiar end command. As you can see, we use this method in our for loop which takes the indicated form — basically, Lua uses the index i, starts at #asteroidsTable, stops at 1, and counts by -1 (decrements). Inside the for loop, we must include code which should be processed each time the loop iterates. If there are ten asteroids in the table, the loop will iterate ten times. If there's just one asteroid in the table, it will iterate once. Essentially, thisAsteroid is set to the table item at the index number within the brackets (), so by using the for loop's index of i, we easily gain a reference to each asteroid in the table as the loop iterates from start to finish. It's very important to understand basic Lua memory management and how it relates to Corona display objects. The first command above, display.remove( thisAsteroid ), will remove the asteroid from the screen, visually. However, that command alone will not release the asteroid from Lua memory. Why? Because we stored an additional reference to the asteroid inside the asteroidsTable table, Lua cannot free up the memory allocated to the asteroid object until that reference is removed. That's why we perform the second command, table.remove( asteroidsTable, i ), directly afterward. This effectively removes that additional reference and, because there are no other persistent references to the object, the Lua garbage collection process can then automatically free its allocated memory. That concludes our asteroid cleanup! Basically, on each iteration of the game loop, we use the for loop to check for asteroids which have drifted substantially outside of the screen bounds. Each of those "dead" asteroids is then removed from the screen and removed from the asteroidsTable storage table, keeping the total asteroid count down and memory usage low. Although you might imagine a game loop as code/functionality which updates on every frame of the application runtime — up to 60 times per second — that's not necessarily true for every app. Because our game loop is a standard function, we have complete control over how often it runs, and when. There are a couple different ways to run a game loop function repeatedly. In this game, we clearly don't want to generate 60 new asteroids per second, and it's not necessary to perform cleanup tasks that often either. So, we'll implement a repeating timer instead. First, we state that the gameLoopTimer placeholder variable (declared earlier) will be associated with our timer. This allows us to use that variable as a reference/handle for pausing or canceling the timer later, if necessary. Next, we call timer.performWithDelay(). This convenient command tells Corona to perform some action after a specified number of milliseconds. Timers are useful for a wide array of game functionality, so get comfortable with them! Inside the parentheses, we start with the number of milliseconds to wait (delay) until the timer fires. Here we use 500 which is exactly half a second, but you can experiment with other values. A lower number like 250 will make asteroids spawn faster and increase the difficulty of the game, but don't set this value too low or asteroids will generate too quickly and crowd the screen. The next parameter is the function which will be called/run when the timer fires. Obviously we specify gameLoop here. Finally, we include the optional iterations parameter with a value of 0. If this parameter is omitted, timers will simply fire once and stop. If you include this parameter, the timer will repeat for that number of iterations, but don't be fooled by the 0 in this case — we are not telling the timer to "run zero times" but rather to repeat forever. Basically, passing 0 or -1 will cause the timer to repeat indefinitely (unless we tell it to pause/stop). All done! The game loop is complete and we have a timer in place to run it repeatedly and indefinitely. Save your modified main.lua file, relaunch the Simulator, and you should see new asteroids beginning to appear, steadily drifting and rotating across the screen. Our game is really coming to life now! When a laser collides with an asteroid. When an asteroid collides with the ship. Local collision handling is best utilized in a one-to-many collision scenario, for example one player object which may collide with multiple enemies, power-ups, etc. Global collision handling is best utilized in a many-to-many collision scenario, for example multiple hero characters which may collide with multiple enemies. While this game has just one player object (the ship), it might seem that the best choice is local collision handling. However, the game will also need to detect collisions between multiple lasers and multiple asteroids, so global collision handling is a better option. Before we get into collision handling, we need a function that can be called to restore the ship following collision with an asteroid. In our game, we'll mimic classic arcade games where, as the new ship fades into view, it's temporarily invincible — after all, it wouldn't be fair to allow players to die consecutive times without being given a chance to dodge incoming asteroids! The first command, ship.isBodyActive = false, effectively removes the ship from the physics simulation so that it ceases to interact with other bodies. We do this (temporarily) so that, as the ship fades back into view, colliding asteroids will not trigger another collision response. The next two lines simply reposition the ship at the bottom-center of the screen. The final command might not make complete sense right now, but it will after we add "death" functionality further down. Essentially, this transition.to() command fades the ship back to full opacity (alpha=1) over the span of four seconds. It also includes an onComplete callback to an anonymous function. This function restores the ship as an active physical body and resets the died variable to false. Similar to touch events, collisions have distinct phases, in this case "began" and "ended". The "began" collision phase is by far the most common phase you'll need to handle, but there are instances where detecting the "ended" phase is important. Don't worry too much about this now — here, we simply isolate the "began" phase by wrapping our functionality in a conditional clause. For simplicity throughout the function, we reference the two objects involved in the collision with the local variables obj1 and obj2. When detecting collisions with the global method, these objects are referenced by event.object1 and event.object2. 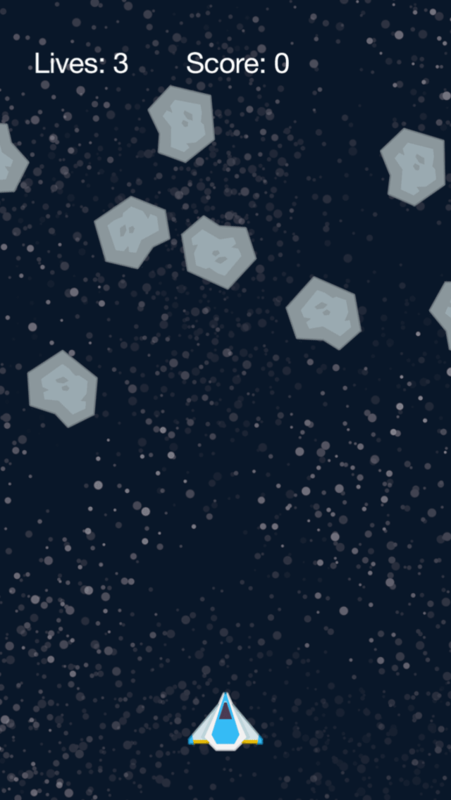 Let's handle our first collision condition: lasers and asteroids. Remember how we assign a myName property to each object when we create it? This property now becomes critical as a means to detect which two object types are colliding. Here, the opening conditional clause checks the myName property of both obj1 and obj2. If these values are "laser" and "asteroid", we know which two object types collided and we can proceed with handling the outcome. When detecting collisions with the global method, there is no way to determine which is the "first" and "second" object involved in the collision. In other words, obj1 may be the laser and obj2 the asteroid, or they might be flipped around. This is why we build a multi-conditional clause to detect both possibilities. Inside the conditional clause, let's begin by simply removing the two objects via display.remove(). While a fancy explosion effect would be awesome, this project merely exhibits how to handle collisions — how you expand on this later depends on your imagination! In this loop, we also utilize a minor efficiency trick known as breaking, executed by the break command. Because we're only looking for one specific asteroid, the loop can immediately break/stop once that asteroid has been removed, effectively stopping any further processing effort. This conditional check might seem a little strange, but we need to confirm that the ship has not already been destroyed. As the game progresses, or with a faster asteroid spawning rate, it's entirely possible that the ship will be struck by two asteroids almost simultaneously. Losing two lives in that case obviously isn't fair, so we check the value of died and only proceed if it's false. Inside this if-then clause, let's immediately set died = true because the player actually has died this time! In the opening clause of this statement, if lives is equal to 0, we simply remove the ship entirely. This is the point where you could show a "game over" message or perform some other action, but for now we'll leave the possibilities open. In the default else clause (the player has at least one life remaining), we make the ship invisible by setting its alpha property to 0. This ties into the restoreShip() function which we wrote earlier where, when the ship fades back into view, the transition.to() command transitions the ship's alpha back to 1. Immediately following that line, we actually call the restoreShip() function after a delay of one second — this yields a slight delay before the ship begins to fade back into view. All of our collision logic is now in place, but absolutely nothing will happen unless we link it up! Since we decided to implement collisions in the global method, it only takes one command to tell Corona that it should listen for new collisions during every runtime frame of the app. This command is similar to previous event listeners where we added a "tap" or "touch" listener type to a specific object. Here, we simply add a "collision" listener type to the global Runtime object. That's it! Save your main.lua file, relaunch the Simulator, and your game will be finished — the player has full control over the ship, asteroids continue to spawn and move across the screen, score and lives are accounted for, and we basically have a fully functioning game! Just in case you missed something, the complete program is available here. This project is slightly more complicated than the previous one, so it may be helpful to download the original source code to compare with what you've created. table.insert() Inserts a given value into a table. table.remove() Removes an item from a table at the specified index. math.random() Returns a pseudo-random number from a sequence with uniform distribution. object:setLinearVelocity() Sets the x and y components for a body's linear velocity. object:applyTorque() Applies rotational force to a physical body. object.isBullet Boolean for whether a body should be treated as a "bullet." object:toBack() Moves a target object to the visual back of its parent group. transition.to() Animates (transitions) a display object using an optional easing algorithm. display.remove() Removes an object or group if not nil. object:setFocus() Sets a specific display object as the target for all future hit events ("touch" and "tap"). timer.performWithDelay() Calls a specified function after a delay. object.isBodyActive Sets or gets a physical body's current active state.